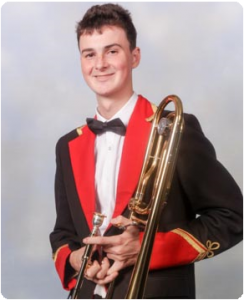 Andrew started playing Trombone at the age of 9 in 2006, in the beginners group at Mount Charles Youth under Bianca Davies, progressing into Mount Charles Youth Band shortly after and remaining under the personal tuition of Bianca. Andrew rapidly gained experience at Mount Charles Youth and, like his brother James, made several appearances with them at the National Youth Championships in Manchester, Music for Youth at the Symphony Hall Birmingham and The British Open Youth Championships at Prestatyn under Musical Directors such as Richard Marshall and Philip Harper. In 2008 Andrew spent some time at a successful St. Breward Band under Garry Lannie but in 2009 the family jumped ship to St. Dennis Band but there was no seat for him in the Senior Band Trombone Section. However he enthusiastically played with the Junior & Youth Bands and sat in with Senior Band rehearsals whenever he could. He soon made rapid progress with the help of Bianca, Colin Whitford, Leonard Adams and, of course, Darren Hawken. When the Solo Trombone seat became vacant he was dropped in the deep end and told to swim!! After finishing Secondary School Andrew went on to study A-Levels at Truro College and is currently studying for a Geology BSc Degree at Plymouth University and commutes to and from rehearsals. Andrew was also a member of the Cornwall Youth Brass Band from 2008 to 2016 and attended no less than 16 Christmas and Easter Courses and was extremely proud to be the Principal Trombone for several years. He was especially proud to be Principal Trombone at the same time his brother, James, was Principal Cornet – so were his Mum and Dad!!! Andrew continues to enjoy solo and quartet contests and has achieved grades 4,5,6,7 and 8 with distinction. Andrew has enjoyed many highlights with St. Dennis Band, a few being winning and playing in the square at Bugle Contest twice, winning the First Section National Finals and many other great contest performances under Darren Hawken. Andrew is extremely happy playing in the best (and tallest!!) section in the band and he enthusiastically gets involved with all the social events and particularly enjoys celebrating his Birthday every year at the Band’s Christmas Eve bash!! Daniel started playing in 2009 at the age of 11 with Mount Charles beginners on percussion. After approximately 9 months he felt it was time for a change of instrument as he wanted to learn Brass. This is when he decided to learn to play the Trombone. Daniel progressed into the Youth Band where he soon found himself sat in the 1st trombone seat due to a player vacancy arising at the time. Daniel took this opportunity to further his playing ability and really enjoyed the challenge. Daniel was also a member of the Bugle Band where he played second trombone alongside Mike Harris and it was here that he was taught to read bass clef by Mark Arnold. 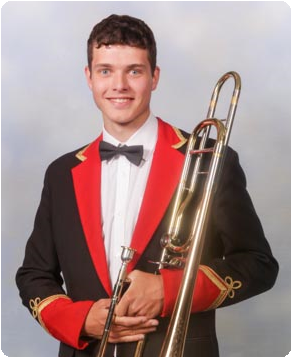 Daniel then decided to join St Austell Band in early 2013 before joining St Dennis Band the following October on second trombone. He thoroughly enjoys his time with the band, where he has made some great friends and experience some excellent contest results along the way. His sister Rachael plays Baritone at St Dennis. Daniel is currently doing an electrical apprenticeship and in his spare time he likes to watch his local football team AFC St Austell. Colin started playing tenor trombone at the age of 11 at Brannel School mainly because it got him out of lessons on a Friday. Soon after he joined the St Dennis Band and soon progressed through the Junior and Youth to the Senior Band aged 14 where he stayed until 1996 mostly on tenor trombone but when the band had no bass trombone self taught himself Bass Clef to fill the position for a while. In 1996, Colin with a young family decided to have a break from full time banding but still helped other bands. In 1998 Colin joined the Bodmim Town Band on 2nd trombone to link up again with mate and fellow trom player Colin Barrett. His time at Bodmin was very successful helping them win the areas, Yeovil also competing at the Grand shield, English Masters as well as many local successes. Family and work commitments meant Colin left Bodmin in 2000. 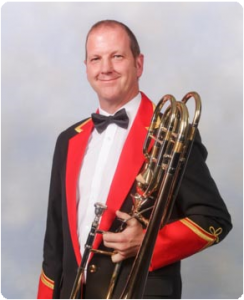 2001 saw Colin rejoin St Dennis who had just qualified for the forth section finals but where short of Bass Trombone. Ten years later, two National titles and numerous area and local successes, Colin is proud to have helped the band get back to where he feels they belong. Colin is married to Tracey with two daughters and is a self employed builder and has just finished building his own house working on it evenings and weekends (between band of course).